Blake Crouch is the author of more than a dozen bestselling suspense, mystery, and horror novels. 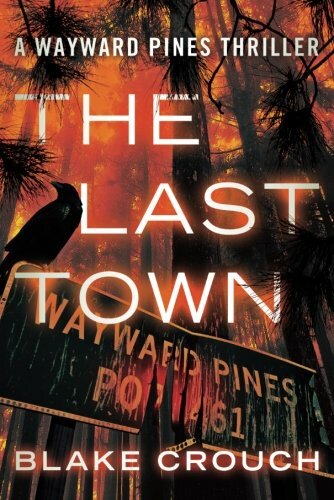 The Last Town, the conclusion to the Wayward Pines Series, is scheduled to debut as a major television series on Fox in the winter of 2015. Wayward Pines was the quintessential American small town. With its beautiful homes and perfect people it seemed like the ideal place to live and raise a family. But that’s the problem—it was too perfect. Everything in Wayward Pines was planned and no one needed to worry about wanting for anything. Food, jobs, even companions were all taken care of the by central authority; however, while there were many picturesque roads crisscrossing the town, none of them led out of Wayward Pines. An electrified fence surrounded the burg, causing one to wonder: Was the fence there to keep the residents in or to keep something else out? David Pilcher created this idyllic setting, as well as its occupants, in the mountains of Idaho. In a specially constructed superstructure dug deep into the side of a huge mountain, hand-picked people from the 21st century were frozen in special tubes. Pilcher convinced the volunteers the human race was doomed, thus the willing participants believed their sacrifice was a chance to save humanity. When the people awoke from their frozen slumbers in the year 3813, they discovered they were the only humans remaining. What they didn’t know was there was a shocking secret Pilcher kept hidden from this last earthly colony, one that would change their future. As the town’s residents adjusted to their new lives, they discovered things were not as they remembered. There were no iPhones, iPads, Facebook, or Twitter. People actually interacted as they did in the 20th century—face to face. No TV or mail. There were phones but only within the town. There was no connection with the rest of the world. The other stark difference: each person is assigned to a house, a job, and given a husband or wife, without regard to who they are or what they did in their previous lives. Their sole purpose? To perpetuate the species. In an interesting twist, several residents were chosen as nomads. They were sent out beyond the fence to determine exactly what lies beyond. Are there any other humans beings remaining? Any other signs of life? Years later only one returns to Wayward Pines, and what he discovered on his journey is shocking. The tale is interesting, captivating, and suspenseful. The author includes a love triangle that heightens the intrigue and conflict, and his concept of a planned society seems plausible. Eventually Pilcher’s secret is revealed to the townspeople. In an act of revenge, Pilcher does the unconscionable—he turns off the electrified fence and opens the only gate to the town. The result is horrifying creatures invade and attack the enclave and its residents. This act of revenge by Pilcher, which he justified by his irrational belief that the townsfolk no longer thought of him as a god, begins a cycle of horror and violence that is terrifying and shocking. The Last Town is well written, its characters interesting and believable. The ending is somewhat surprising, but nonetheless satisfying. Blake Crouch leaves the door open for another installment of Wayward Pines—or at least a spinoff.